Over a three-decade period, several entities have published comic books based on Harmony Gold's 1980's, anime/animated television series, Robotech. That includes the defunct Comico the Comic Company and DC Comics' imprint, WildStorm Productions. 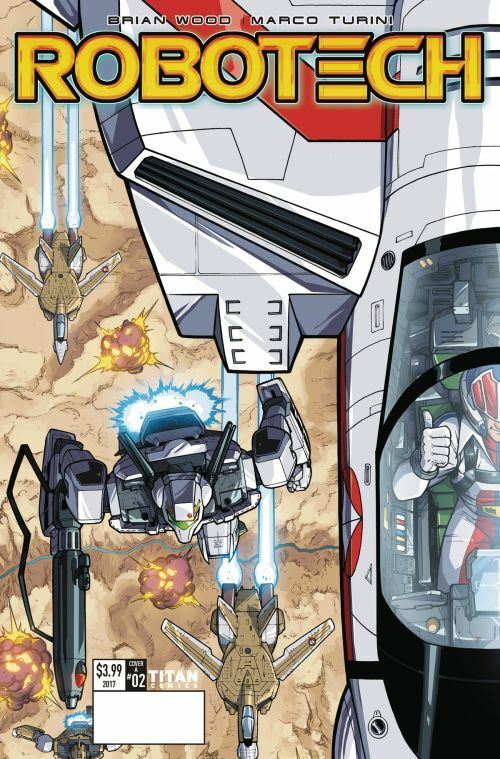 Titan Comics brings Robotech back to comic books with the new series, Robotech. It is written by Brian Wood; drawn by Marco Turini; colored by Marco Lesko, and lettered by John Workman. Robotech begins when a giant extraterrestrial vehicle crash lands on Macross Island in the South Pacific. A decade later, the people of Earth have adapted the vessel's alien technology, which they call “Robotechnology,” to advance human technology. The ship is now known as the Super Dimension Fortress or SDF-1, and it is the epicenter of “The Robotech Project” and of the city built around it, Macross City. Robotech #2 finds the Earth under siege by an alien armada. In Macross City, talented but cocky pilot, Rick Hunter, has taken one of the SDF-1's Veritech fighters out of necessity. Now, he and his passenger, Lynn Minmei, come face to face with a giant alien being, and neither is sure how to use the Veritech to fight the creature. Meanwhile, aboard the SDF-1, Captain Henry Gloval comes to a shocking decision on using some of the ship's incredible Robotechnology. THE LOWDOWN: Robotech #1 was a fantastic first issue; so is this second issue. Like the first issue, I like Robotech #2 enough to highly recommend it to Robotech fans. Once upon a time, I was a big Robotech fan; now, I have not engaged the franchise in decades, but this comic book has reignited my Robotech love. Right now, I am looking for two things in this new Robotech comic book. One, I want it to be a well-produced comic book with good writing, good art, and overall engaging storytelling. Two, I want it to recall classic Robotech while also exploring new possibilities for the series and also going places the original might have, but did not. So far, I'm getting both of those things from this very entertaining comic book. I READS YOU RECOMMENDS: Fans of Robotech will want to read Titan's new Robotech comic book series.